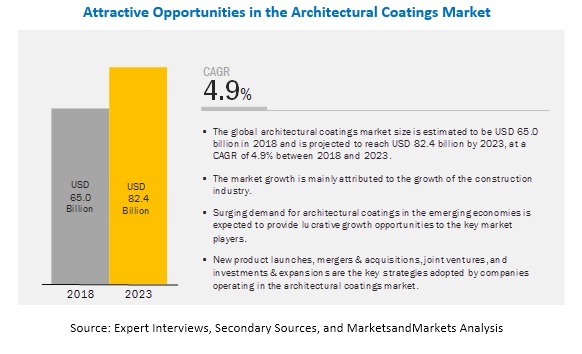 [170 Pages Report] The market of Architectural coatings is projected to grow from USD 65.0 billion in 2018 to USD 82.4 billion by 2023, at a CAGR of 4.9%, during the forecast period. The global architectural coatings market is witnessing high growth on account of increasing applications, technological advancements, and the growing demand in APAC. The economic growth in developing countries, increasing investment in infrastructure, stringent environmental regulations, growing purchasing power, and the rising demand for green and environmentally friendly coatings are also leading to the growth of the market. The acrylic segment accounted for the largest share in 2017 because of its usage in major architectural coatings. The weathering and oxidation resistance of acrylics is better than oil-based paints, alkyds, or epoxies as the chief components of acrylic polymers provide a polymer structure that has little tendency to absorb UV light. Moreover, acrylics possess good color and gloss retention. They are well known for their durability as they protect the underlying substrate from degradation caused by exposure to rain, snow, wind, and UV light. APAC is projected to be the fastest-growing market, in terms of both volume and value, during the forecast period. The Architectural coatings market in APAC is estimated to account for the largest share, in terms of both volume and value, in 2018. The APAC Architectural coatings market is driven by the growing population and economic growth. Both the residential and non-residential sectors in China and India are expected to develop during the forecast period, which, in turn, will drive the the demand for Architectural coatings from this region. PPG Industries, Inc. (US), Akzo Nobel N.V. (Netherlands), The Sherwin-Williams Company (US), Kansai Paints Co., Ltd. (Japan), Asian Paints Limited (India), and Nippon Paint Holdings Co., Ltd. (Japan). Some of the other players operating in the global market include BASF SE (Germany), Masco Corporation (US), Jotun Group (Norway), and RPM International Inc. (US). Sherwin-Williams is a diversified paints and coatings company. It is a global leader in the manufacturing, development, distribution, and sale of decorative paints and coatings and related products to professional, industrial, commercial, and retail customers. It has a strong customer base and operates in several countries of Europe, North America, and APAC. In June 2017, Sherwin-Williams Co. completed the acquisition of the Valspar Corp., a Minneapolis-based global paints & coatings company, for about USD 11.3 billion. In May 2014, Sherwin-Williams Co. entered into a joint venture with Red Sea Housing Services Company to launch its premium paints company in Saudi Arabia, which helped the company to grow faster and cater to the demand from the Middle East. What are the upcoming applications of Architectural coatings? Which segment has the potential to register the highest market share? What is the current competitive landscape in the Architectural coatings market in terms of new technologies, production, and sales? What will be the future of the Architectural coatings? 13.6 Kansai Paint Co., Ltd.
13.7 Nippon Paint Holdings Co., Ltd.
13.11.7 Benjamin Moore & Co.
13.11.11 Carpoly Chemical Group Co., Ltd.
13.11.17 H-I-S Coatings and Paint Manufacturing Co.
13.11.18 Fujikura Kasei Co., Ltd. The study has involved four major activities to estimate the current market size of architectural coatings. Exhaustive secondary research was done to collect information on the market, the peer market, and the parent market. The next step was to validate these findings, assumptions, and sizing with industry experts across the value chain through primary research. Both top-down and bottom-up approaches were employed to estimate the complete market size. Thereafter, the market breakdown and data triangulation methods were used to estimate the size of the segments and subsegments of the overall market. In the secondary research process, various secondary sources, such as Hoovers, Bloomberg BusinessWeek, and Dun & Bradstreet have been referred to identify and collect information for this study. These secondary sources also included annual reports, press releases & investor presentations of companies; white papers; certified publications; articles by recognized authors; gold standard & silver standard websites; food safety organizations; regulatory bodies; trade directories; and databases. 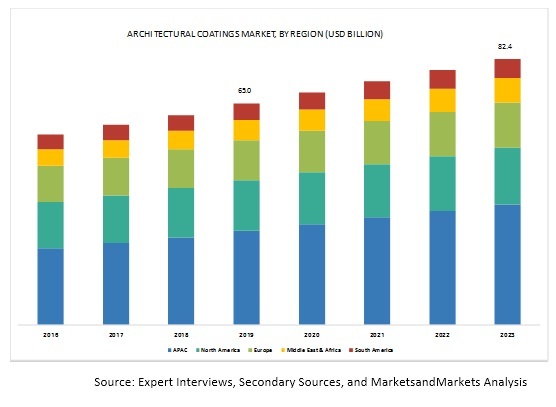 The architectural coatings market comprises several stakeholders, such as raw material suppliers, processors, end-product manufacturers, and regulatory organizations. The demand side of this market is characterized by the development of the end-use industries such as HVAC, automotive & transportation, and others. The supply side is characterized by advancements in technology and diverse applications. Various primary sources from both the supply and demand sides of the market were interviewed to obtain qualitative and quantitative information. After arriving at the overall market size-using the market size estimation processes as explained above-the market was split into several segments and subsegments. In order to complete the overall market engineering process and arrive at the exact statistics of each market segment and subsegment, the data triangulation and market breakdown procedures were employed, wherever applicable. The data was triangulated by studying various factors and trends from both the demand and supply sides. Note: Core competencies1 of the companies are determined in terms of their key developments and key strategies to sustain in the market. PPG Industries, Inc. (US), Akzo Nobel N.V. (Netherlands), The Sherwin-Williams Company (US), Kansai Paints Co., Ltd. (Japan), Asian Paints Limited (India), and Nippon Paint Holdings Co., Ltd. (Japan). Some of the other players operating in the global market include BASF SE (Germany), Masco Corporation (US), Jotun Group (Norway), and RPM International Inc. (US) A total of 28 players are covered. This research report categorizes the architectural coatings market based on Resin Type, Technology, User Type, Application, and Region. MarketsandMarkets offers customizations according to the specific needs of the companies with the given market data.